1. A fun opportunity to hang out with all your awesome choir friends with minimal supervision where you can sing 4-5 rehearsals a day, eat (contraband) junkfood, enjoy the outdoors, or as I often did in later years, work with other studious choristers to complete homework at communal group lounges located at the backs of cabins. 2. A frightening prospect where you are cast into the seclusion of the woods, away from your own bed for the first time in your life, and are forced to make friends or spend the choral season alone and friendless. You can probably imagine which scenario I viewed my first choir camp as. Yes, if you guessed number two, that is absolutely correct. It would be a few years at least before I developed a comfortable routine at camp. I remember remember asking my conductor, Jan, if camp was mandatory. When I found out that there was no way out of it, I tried to mentally prepare myself for the trip into the musical wilderness. I did not anticipate, however, the surfacing of my mother's nerves. I remember her convincing me to stay home the night before I was supposed to leave. That would be choir social suicide? I knew the consequences of not going and as afraid as I was to spend a weekend with choristers who were strangers to me, the thought of still not knowing everybody when they all returned to choir after the weekend was even more daunting. I was frantically trying to assemble the things I would need, and since I had never traveled before, I did not have travel friendly sizes of any necessary toiletries. Hardly a worry, I know, but it is amusing how devastating the effects of non-conformity can have upon a child. Small details such as using dollar store markers to color next to a child who owns the spectrum of vibrant Mr. Sketch markers with their addictive scents, coloring with more brilliancy than dollar store markers could ever hope to achieve. Oh, the shame! However, going back to the matter of lacking necessary toiletries, my mother disguised her worry by lending me an array of lovely travel-sized toiletries. My Dad showed his worry by stuffing my backpack full of cookies and juice boxes since his greatest fear would be me starving out in the wild. I remember entering the bustling cabin out at camp He-Ho-Ha. The continuous metallic snapping of the doors as children were running in and out, the hollow rumbling produced by sock-wearing feet echoed through the wall from the adjoining cabin, and the crackle of the plastic lined mattresses as choristers tested out their temporary beds. There were children running everywhere and though I managed to secure a place to sleep for myself in a room full of choristers, I ultimately felt alone. What I did not know at that moment is that I would emerge from choir camp as a new person. As I opened my backpack and watched the plethora of snacks spill out onto my sleeping bag, it occurred to me that I had food to share. For anybody who needs to make friends, in choir or anywhere else, just offer them free food! Later, I opened my toiletry bag to see what my Mom packed and a young chorister passing by stopped in her tracked and gawked at the array of Aveda products I was lent to use. "Those are designer!" she exclaimed in surprise, and being surprised at the fact that she was paying attention to me, I gave her a shy smile, but was silently pleased at the things I was given to use. I went to the first choir rehearsal in the large rehearsal hall at the camp and my glowing conductor got things underway. I am not sure if it was during this time, or during another rehearsal that weekend, but she got the idea to have a little contest. She picked up the small, gleaming, pumpkin-orb sitting on the grand piano and showed it to all of us. There would be a contest to see whoever is sitting with the best posture throughout camp, determined by our pianist, Bob, and whoever he named as the chorister with the best posture would win the now highly coveted pumpkin trophy in her hands. It surprises me to this day how so much symbolic power can be bestowed upon something so small. When Jan announced the contest, I remember scoffing at the fact I had no chance at winning the cute little pumpkin. Sure, prior to camp I tried to sit with good posture, I was not taught any other way! It was my first time in choir, so whatever Jan told me to do...I did. Sit at the edge of my chair? done. Form a better "oh" vowel with my lips? sure. Breathe from my tummy and not my chest? o.k. Needless to say, I didn't think about winning the trophy at any point during the rest of the weekend. I sat there in silence. 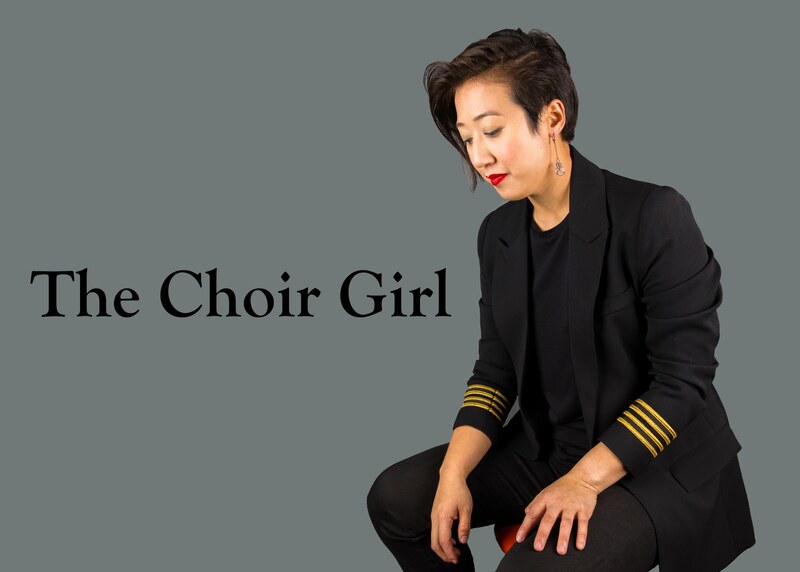 Sure, my posture was alright, but was it good enough to trump the posture of choristers who had years of experience on me? I didn't think so. I was truly shocked. I remember there was cheering and applause and I remember being beckoned from my seat to the front of the choir to receive my mini pumpkin award. I remember walking up to Jan, still stunned into silence at the news, to receive my pumpkin award while trying to smile for the photo being taken of me with her. I walked back to my seat as the choristers buzzed around me to get a closer look at my glossy pumpkin prize. Back at the cabin as parents were showing up to pick up their children, everybody wanted to hold my prize and see what the little pumpkin looked like up close. I was happy to share and show everybody my new trophy and I was beaming at the fact that everybody was so happy for me and I enjoyed the fact these initial strangers were feeling like my friends at the end of the weekend. I'm sure my Dad was relieved to see that his shy daughter was getting so much positive attention from all the young girls as people were calling out my name and scurrying after me to look at my prize. Personally, the pumpkin did not leave me tripping over myself, as it did others. I thought the pumpkin was cute and it was surreal to go home with the prize. When I went home and put the pumpkin on a shelf, and promptly forgot about it since it lost some of its power away from the choral infused surroundings, I was surprised to see it was eaten through with mold a few weeks later. I happily tossed it out, but the symbolic potency that little pumpkin has remains ingrained in me to this day. Receiving that award was a catalyst for my choral career and gave me the confidence and reassurance that I knew what I was doing and that I was good at it as well. Even if I didn't win the award, I'm sure I would still be singing today, however, it just felt really nice to be rewarded and recognized for choral eagerness so early on in my choral experience. Thus, I left camp with good friends, lasting memories, and a little pumpkin award. My pumpkin talisman was the first gems I acquired during a definitive choral rite of passage. Until next post, take care readers!